A left-wing editorial cartoonist faced backlash over the weekend for drawing a cartoon that critics say mocked Supreme Court nominee Brett Kavanaugh‘s 10-year-old daughter, Liza. A right-wing “anonymous Twitter user” was upset over a recent Chris Britt cartoon reworking a portion of Brett Kavanaugh’s opening statement before the September 27 Senate Judicial hearing, and Fox News has picked it up. In a Facebook statement Monday, the Illinois Times said Britt was “a regular contributor,” but “not an employee.” The paper added that the cartoon was posted on Britt’s Facebook page and “did not appear in our publication or on our website. Chris Britt did not respond directly to Fox News inquiries. On his Facebook page, Britt responded to one critic by saying “I’m not the one who brought up his children. Brett ‘I LOVE BEER’ Kavanaugh brought them up.” The page was later removed from public view. Fox News notes that most of Chris’ recent cartoons deal with the Kavanaugh assault allegations. Fox News was actually late to the game, as conservative sites such as Newsbusters, Townhall, The Daily Wire, and others were registering their disgust earlier Monday. In what universe is this mocking the daughter? Manufactured outrage as a political tactic. I wouldn’t call it mocking, but setting aside what the cartoon says, dragging a public figure’s young child into the fray is wrong. Conservative or liberal they’re kids and should be left off the battlefield. May Chris encounter a Jihadi John and be burned alive in a cage. Seems appropriate. This cartoon is merely an echo of the evil left’s tactics and cowardly douchebaggery. This scurrying little crud-stain Chris Britt is probably surprised Schumer and Da Nang Blumenthal didn’t invite him up to the capitol for high tea. Next to the evil left’s odious smear-tactics this cartoon is paltry stuff. 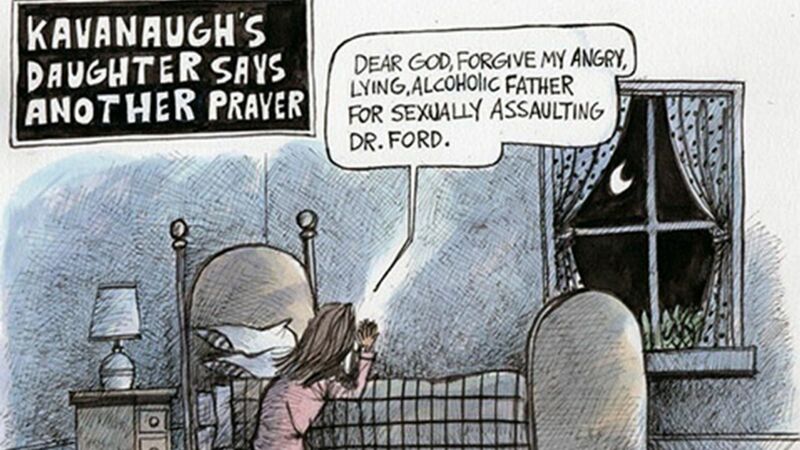 I’m ashamed for the cartoonist Chris Britt and for the publications that ran this vile cartoon. The left continue to show how desperate they truly are! Is this the high road Michele Obama spoke about? more feigned outrage just from the other side this time. It does not mock his daughter, it mocks Kavanaugh.